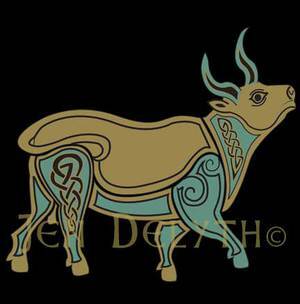 The Bull is revered by the Celts as Hu the Mighty, and he appears throughout their mythology with otherworldly significance related to the fertility of the land and the tribe. The mythic power of totemic beasts often relates to the forces of the land and the cosmos. In the Irish myth The Battle Raid of Cooley, Taín Bó Cuailnge, there is a supernatural battle for Ireland between the Brown Bull of Ulster, Donn, and the White Horned One, Findbennach, the Bull of Connaught. They lock together in terrible combat. Donn destroys the White Bull, and the Irish political landscape is established.